Supporters of DREAMers head to the streets in protest. Southland Democratic leaders and immigrant advocates lashed out harshly today at the Trump Administration decision to phase out the Deferred Action for Childhood Arrivals program, which has protected an estimated 800,000 people – including more than 242,000 in California – who were brought to the country as children from deportation. Activists immediately planned to take to the streets to protest the move, which was announced by Attorney General Jeff Sessions on behalf of President Donald Trump. Congresswoman Lucille Roybal-Allard, D-Los Angeles, called the president’s decision to rescind the program “outrageous.” This is a “heartbreaking day for the US and the bright young DACA recipients who know no home but America,” she said on Twitter. Under the action by the Trump Administration, Congress will be given six months to attempt to pass legislation addressing DACA before the program is phased out. In defending the decision, Trump said President Barack Obama over-stepped his authority in creating the DACA program. Those arguments did little to appease Democratic lawmakers. Sen. Kamala Harris, D-California, said DACA recipients “make our nation strong and represent the best of America” and rescinding the program “undermines our nation’s values and is a cruel betrayal” of DREAMers. Rep.Adam Schiff, D-Burbank, criticized the “cruel and arbitrary attack” on them. Sen. Dianne Feinstein, D-California, urged Congress to move forward with legislation known as the DREAM Act that would provide a path to citizenship for DREAMers — the term used for DACA recipients. “Failure to protect young people who have come out of the shadows would constitute an abject moral failure,” Feinstein said. Officials with the Service Employees International Union decried what it called a “shameful attack” against DACA beneficiaries. The Coalition for Humane Immigrant Rights of Los Angeles said members were ready to gather at the offices of Republican legislators, including Rep. Steven Knight in Santa Clarita and Rep. Mimi Walters in Irvine, as well as Rep. Kevin McCarthy’s office in Bakersfield. 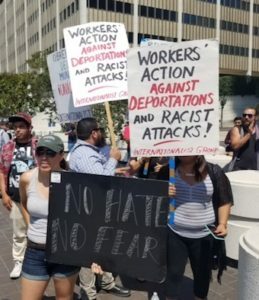 Additionally, scores of workers and community members planned a midday march through downtown L.A. from the steps of City Hall to the federal building on the 200 block of east Temple Street. Introduced by Obama in 2012, DACA allows people who were brought into the United States illegally as children to work and study in the country without fear of being deported. DACA has been available to immigrants without criminal records who were brought to the country when they were younger than 16 years old. Work permits issued under DACA must be renewed every two years. Trump has taken a hard stance against illegal immigration, but until recently had not given a strong indication of whether he would keep DACA in place. Rep. Ted Lieu, D-Torrance, is one of many elected officials of both parties who have criticized the president’s plans. September 5, 2017 Copyright © 2012 Eastern Group Publications, Inc.